Operettas are usually shorter than operas, and are usually of a light and amusing character. Operettas are often considered less "serious" than operas. While an opera's story is usually believable and more relatable to its audience, an operetta aims to simply amuse. Topical satire is a feature common to many operettas. However, satire is used in some "serious" operas as well: Formerly, in countries such as France, operas expressed politics in code – for example, the circumstances of the title character in the opera Robert le diable referred, at its first performance, to the French king's parental conflict and its resolution. Normally some of the libretto of an operetta is spoken rather than sung. Instead of moving from one musical number to another, the musical segments – e.g. aria, recitative, chorus – are interspersed with periods of dialogue. There is usually no musical accompaniment to the dialogue, although sometimes some musical themes are played quietly under it. Short passages of recitative are, however, sometimes used in operetta, especially as an introduction to a song. The main difference between the two genres is that most operettas can be described as light operas with acting, whereas most musicals are plays with singing and dancing. This can be seen in the performers chosen in the two forms. An operetta's cast will normally consist of classically trained opera singers. A musical may use actors who are not operatically trained, and the principals are usually called upon to dance. These distinctions can be blurred: Ezio Pinza, Paulo Szot, Renée Fleming and other opera singers have appeared on Broadway and Broadway musicals have been remounted in opera houses. There are features of operetta in Kern and Hammerstein's Show Boat (1927), among others. The characters in a musical may be more complex than those in an operetta, given the generally larger amount of dialogue. For example, the characters in Lerner and Loewe's musical My Fair Lady – based on George Bernard Shaw's 1914 play Pygmalion – are essentially unchanged from those in Shaw's stage work, because the musical version is quite faithful to the original,[notes 1] even to the point of retaining most of Shaw's dialogue. Man of la Mancha, adapted by Dale Wasserman from his own ninety-minute television play I, Don Quixote, retains much of the dialogue in that play, cutting only enough to make room for the musical numbers which were added when the play was converted into a stage musical. Operetta grew out of the French opéra comique around the middle of the 19th century, to satisfy a need for short, light works in contrast to the full-length entertainment of the increasingly serious opéra comique. By this time, the "comique" part of the genre name had become misleading: Georges Bizet's Carmen (1875) is an example of an opéra comique with a tragic plot. The definition of "comique" meant something closer to "humanistic," meant to portray "real life" in a more realistic way, representing tragedy and comedy next to each other, as Shakespeare had done centuries earlier. With this new connotation, opéra comique had dominated the French operatic stage since the decline of tragédie lyrique. Most researchers acknowledge that the credit for creating the operetta form should go to Hervé (1825–1892), a singer, composer, librettist, conductor, and scene painter. In 1842 he wrote the little opérette, L'Ours et le pacha, based on the popular vaudeville by Eugène Scribe and X. B. Saintine. In 1848, Hervé made his first notable appearance on the Parisian stage, with Don Quichotte et Sancho Pança (after Cervantes), which can be considered the starting point for the new French musical theatre tradition. Hervé's most famous works are the Gounod-parody Le petit Faust (1869) and Mam'zelle Nitouche (1883). Jacques Offenbach further developed and popularized operetta, giving it its enormous vogue during the Second Empire and afterwards. 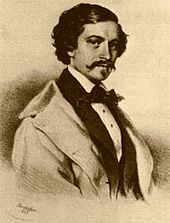 Offenbach's earliest one-act pieces included Les deux aveugles, Le violoneux and Ba-ta-clan (all 1855), and his first full-length operetta success was Orphée aux enfers (1858). These led to the so-called "Offenbachiade": works including Geneviève de Brabant 1859, Le pont des soupirs 1861, La belle Hélène 1864, Barbe-bleue and La Vie parisienne both 1866, La Grande-Duchesse de Gérolstein 1867, La Périchole 1868 and Les brigands 1869. Offenbach's tradition was then carried on by Emmanuel Chabrier, Robert Planquette, André Messager, and others. What characterizes Offenbach's operettas is both the grotesque way they portray life, and the extremely frivolous way this is done, often bordering on the pornographic. Émile Zola describes the back-stage and on-stage situation in the Théâtre des Variétés during the Second Empire in his novel Nana, which takes place in late 1860s and describes the career of operetta diva/courtesan Nana. The character was closely modeled after Offenbach's female star Hortense Schneider, and Offenbach's librettist Ludovic Halévy gave Émile Zola the details. Considering how Zola's Nana describes an Offenbach-style operetta performance in Paris, it is not surprising that the mostly male, upper-class audience crowded the various theaters every evening. Upper-class audiences in other cities like Vienna and Berlin wanted to see these shows in their home towns as well, which inspired worldwide performance of Offenbach's works. The most significant composer of operetta in the German language was the Austrian Johann Strauss II (1825–1899). His first operetta was Indigo und die vierzig Räuber (1871). His third operetta, Die Fledermaus (1874), became the most performed operetta in the world, and remains his most popular stage work. Its libretto was based on a comedy written by Offenbach's librettists. [notes 3] In all, Strauss wrote 16 operettas and one opera, most with great success when first premiered. Many of his lesser operettas are now largely forgotten, since his later librettists were less talented and he often composed independently of the plot. Franz von Suppé, a contemporary of Strauss, closely modeled his operettas after Offenbach. The Viennese tradition was carried on by Franz Lehár, Oscar Straus, Carl Zeller, Karl Millöcker, Leo Fall, Richard Heuberger, Edmund Eysler, Ralph Benatzky, Robert Stolz, Emmerich Kálmán, Nico Dostal, Fred Raymond, Igo Hofstetter and Ivo Tijardović in the 20th century. The Berlin-style operetta coexisted with more bourgeois, charming, home-loving, and nationalistic German operettas – some of which were called Volksoperetten (folk operettas). A prime example is Leon Jessel's extremely popular 1917 Schwarzwaldmädel (Black Forest Girl). These bucolic, nostalgic, home-loving operettas were officially preferred over Berlin-style operettas after 1933, when the Nazis came to power and instituted the Reichsmusikkammer (State Music Institute), which deprecated and banned "decadent" music like jazz and similar "foreign" musical forms. Notable German operetta composers include Paul Lincke, Eduard Künneke, Walter Kollo, Jean Gilbert, Leon Jessel, Rudolf Dellinger, Walter Goetze and Ludwig Schmidseder. English-language operettas were first composed in England by the 1860s, for example, Arthur Sullivan's Cox and Box (1866). Gilbert and Sullivan solidified the format in England with their long-running collaboration during the Victorian era. With W. S. Gilbert writing the libretti and Sullivan composing the music, the pair produced 14 comic operas, which were later called Savoy Operas. Most were enormously popular in Britain, the U.S., and elsewhere. Sullivan and Gilbert and their producer Richard D'Oyly Carte themselves call their joint works comic operas to distinguish this family-friendly fare from the risqué French operettas of the 1850s and 1860s. Their works, such as H.M.S. Pinafore, The Pirates of Penzance and The Mikado, continue to enjoy regular performances throughout the English-speaking world. English operetta continued into the 1890s, with works by composers such as Edward German, Ivan Caryll and Sidney Jones. These quickly evolved into the lighter song-and-dance pieces known as Edwardian musical comedy. Beginning in 1907, with The Merry Widow, many of the Viennese operettas were adapted very successfully for the English stage. Old-fashioned musicals in Britain retained an "operetta-ish" flavour, at least musically, into the 1950s. ^ "faithful to the original" With the exception of the ending, which in the play is pessimistic. ^ Grout, Donald Jay & Williams, Hermine Weigel (2013). A Short History of Opera. Columbia University Press. p. 378. ISBN 0231507720. Retrieved 2 May 2015. ^ Lamb, Andrew. 150 Years of Popular Musical Theatre. Yale University Press, 2001. p. 203. ^ See Bradley, Ian (2005). Oh Joy! Oh Rapture! The Enduring Phenomenon of Gilbert and Sullivan. Oxford University Press. ISBN 0-19-516700-7. and Hewett, Ivan (2 August 2009) "The Magic of Gilbert and Sullivan". The Telegraph. Retrieved 14 April 2010. Jacobs, Arthur (1984). Arthur Sullivan: A Victorian Musician. Oxford University Press. ISBN 0-19-315443-9. Bordman, Gerald (1981) American Operetta. New York: Oxford University Press. Ganzl, Kurt (2001) The Encyclopedia of Musical Theatre (3 Volumes). New York: Schirmer Books. Traubner, Richard (1983) Operetta: A Theatrical History. Garden City, New York: Doubleday. Wikimedia Commons has media related to Operetta.